Welcome to another edition of Monday Night Raw as it took place in St. Louis and the night after the Payback PPV. With the main event for the Extreme Rules PPV already announced as Reigns defends his title against A.J. Styles in an Extreme Rules match. We also get to see how things go with Shane & Stephanie running Monday Night Raw together and hopefully we’ll get an update on Enzo following his concussion scare last night. Let’s get started!!! Cesaro vs. Kevin Owens: This was a really good match between these two as expected with many great spots throughout the match. In the end, Miz attacked Cesaro as he was about to do the Cesaro Swing on Owens causing the DQ finish. Owens got in the face of Miz for costing him the match, but they turned their attention to Cesaro and started to beat him down until Zayn made the save. To end the segment, Zayn held up the title while the crowd was cheering YES!!! New Day & Big Cass vs. Dudley Boyz & Vaudevillians: Everything started with the New Day coming out to cut a promo wishing Enzo well and cut a really good promo. They were interrupted by the Vaudevillians who cut a promo on New Day and about putting Enzo out. The music of the Dudley Boyz hit and they made their way to the ring and said the title tournament should be restarted because they deserve a shot at the titles. The music of Enzo & Big Cass hit and it was Cass, then he proceeded to cut a promo on the Dudleyz and Vaudevillians. Afterwards, he hit the ring and started fighting the Dudleyz & Vaudevillians with New Day. The match was made and it was really good with Big Cass getting the pinfall on D-Von. Becky Lynch vs. Emma: This should be a pretty good feud going forward and the match was alright at best, but I know these ladies can do better. Ambrose Asylum: His guest was Stephanie and after dissing her throughout the segment, she cancelled the Ambrose Asylum and brought back Jericho for his Highlight Reel, but Ambrose met him in the aisle and they fought. After Jericho hit the Codebreaker, he threw Ambrose on the outside and hit him with Mitch from behind. Battle Royal: I’m cool with the Battle Royal and the outcome with Rusev winning it. I think they should use this moment to maybe consider Zack Ryder another push in the future because he’s connecting with the fans again. Natalya and Charlotte: I’m digging this feud between these two ladies and I’m looking forward to their submissions match @ Payback. Roman Reigns & Usos vs. A.J. Styles, Luke Gallows & Karl Anderson: This was an exciting main event from these 6 guys and in the end, Styles picked up the win after hitting one of the Usos with the Phenomenal Forearm. After the match, Anderson & Gallows wanted Styles to hit Reigns with a chair while they held him up, but Styles refused to do it. They proceeded to beat Reigns up some more, but the Usos attacked Styles with a chair and he eventually attacked both of them with a chair. Reigns got up and saw Styles attack the Usos with the chair and he beat down Styles and eventually tossed him through the announce table to end Monday Night Raw. Opening Segment: Monday Night Raw started out with Stephanie coming to the ring, but as soon as she was about to start speaking, the music of Shane McMahon hit. Stephanie told Shane she had a gift for him, which was the picture Mr. McMahon broke of Shane & Vince, then she asked what Shane had planned for tonight. Then Shane asked her what her plans were, then she asked the fans who they wanted and they wanted Shane. As he was about to talk about his plans, the music of Kevin Owens hit and he said he wanted his rematch for the Intercontinental championship and that brought Cesaro out. Cesaro said Owens cost him his match the night before at the Payback PPV and then Shane made the match between the two to determine the #1 contender. I love the IC title picture, but the first night between Stephanie & Shane I wasn’t feeling it. Tyler Breeze vs. Goldust: WTF was that!!! Overall Rating: 7/10- This was another good edition of Monday Night Raw and the only things I wasn’t feeling was the interaction between Stephanie & Shane in the opening segment then the stuff between Goldust, R-Truth, Tyler Breeze and Fandango. 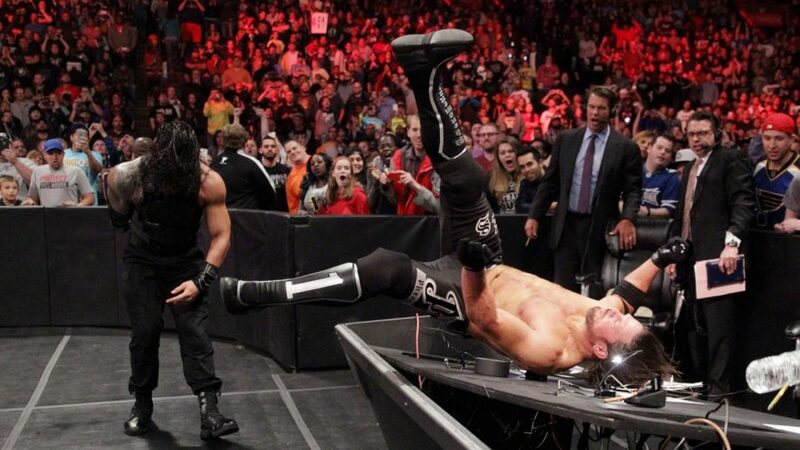 What did you think about this edition of Monday Night Raw? What do you think about the storyline between A.J. Styles and Gallows & Anderson? Head to the comments section below and give me your thoughts about WWE Monday Night Raw from St. Louis.